Hi again, Nosh + Nourish readers! It’s Joy from Lunches + Littles here today with a delicious one pan meal that your whole family will absolutely love. Now, when it comes to summertime, I am all about the cold noodle salads and grilled dinners, but I confess: I still like my warm dishes… And pasta too. What can I say? I’m a girl that loves noodles and so whenever I can make a yummy dish that gives me a little pasta fix, and tons of fresh yummy stuff too, I am one happy Mama. Like this Peanut Noodle Salad. Or this Shrimp Bruschetta Pasta. Or this Rainbow Pasta Salad. Or this Jicama, Mango and Corn Pasta Salad. Summer is basically here; most kids are out of school. And, with the busyness that these days often bring, not to mention all the heat – a light, easy to make dish is where it’s at. Am I right? Or, am I right? And, if you can make said meal in one pan, with fresh ingredients – that is a major double win! And speaking of summer – just this past week our local farmer’s market re-opened and we headed over with the kiddos to get all the goods. I love being able to purchase local produce and while we were there we picked up most of the produce needed for this dish, as well as the bacon we used, from our favorite farmers. – If you haven’t tried heading to a farmer’s market with little ones – I highly recommend it. 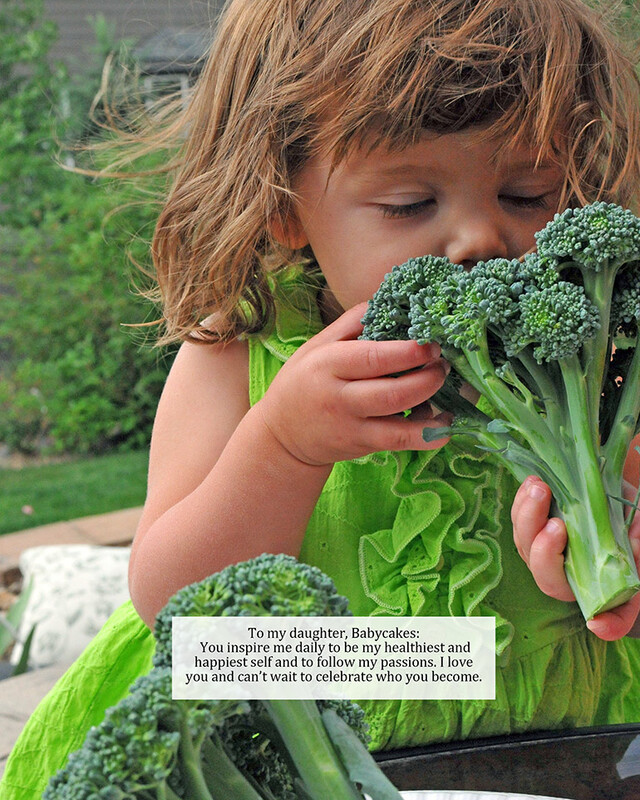 It’s a great way to get your little one(s) hands on with so many different foods, and in my experience makes them more willing to try out a new, or different kind of meal. 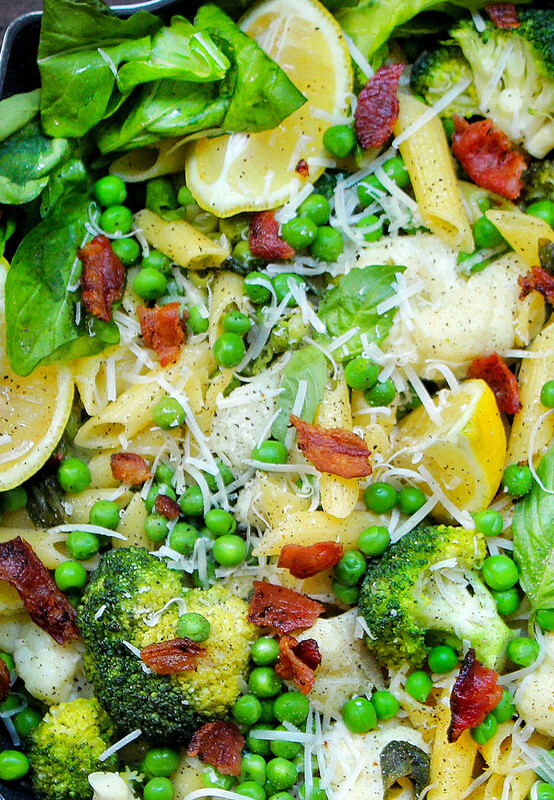 The combination of flavors in this One Pan Gluten-Free Summer Pasta is kinda heavenly. 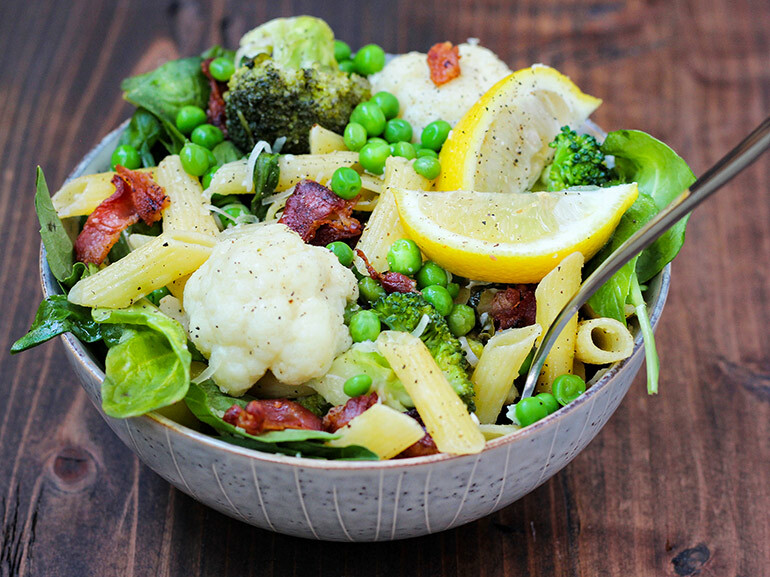 Between the cauliflower, broccoli, shallots, the crumbled bacon pieces, and the fresh-squeezed lemon juice – oh my goodness. Such a delicious burst of flavors perfect for any summer night and it is a dish that uses real, fresh ingredients. This dish has tangy, crisp, sweet and more, and definitely brings something for everyone, and I love that with the use of gluten-free pasta, more can enjoy the dish. So, what are you waiting for? Grab a pan (just one – I promise!) and let’s get cooking!! Light, delicious and so summery; I hope you will give it a try! As always, thank you Kelly for having me share! For more delicious, colorful recipes that are vibrant, nutritious and easy to make – be sure to check out my feed, @lunchesandlittles, where I am serving up easy family-friendly dishes, treats and more all the time! Prep your produce: cut broccoli and cauliflower into bite-sized florets, finely chop shallot, and mince garlic. Set produce aside. In a skillet or large deep pan, heat a generous drizzle of olive oil (about 1 tbsp) over medium heat. Once hot, add in shallots and garlic. Sauté until softened slightly and fragrant (a couple minutes). Then, add to pan: cauliflower, broccoli, peas, pasta, the juice from 1 lemon, plus 2 cups of water. Sprinkle with salt and pepper. Once boiling, remove cover and continue to cook al dente, about 8 minutes, ensuring cauliflower and broccoli is softened and cooked. *Use tongs to stir and continuously move pasta around to avoid sticking. When you only have a couple minute left of cooking, add greens to pan and stir to incorporate. Once dish is complete, remove pan from heat. Top with parmesan cheese, basil leaves for garnish, bacon bits and salt and pepper to taste. Cut your second (remaining) lemon into wedges and either squeeze a bit more fresh lemon juice on top of dish or serve wedges with dish.